Good morning, y’all – back at it in California! Hope your week is fixin’ to be good! If you joined me last night for my Facebook Live video – which was a bit all over the place! – I appreciate it! I shared a few of the new 2018 Holiday goodies that we got on the cruise last week. If you didn’t watch – and want to – here’s the link to it on YouTube! The layout for this one comes from this week’s Freshly Made Sketches. I started with a piece of DSP from the All Is Bright DSP (new 2018 Holiday Catalog offering) and, using the light-string image from the new Making Christmas Bright stamp set, I stamped all over the panel in Call Me Clover ink. Then I adhered it to a Pineapple Punch mat with Liquid Glue. For the middle square, I used a piece of Whisper White and stamped it several times in Tuxedo Black Memento Ink with the same light-bulb image. Then I colored the lights with my Real Red, Call Me Clover and Pineapple Punch Stampin’ Write Markers. I matted the square on Pineapple Punch and then adhered it to the card front with Liquid Glue. I adhered the sentiment to the mat – a little offset – with Liquid Glue and added it to the card front. With the uber-cool die in the new Merry Christmas Thinlits, I cut the word “Merry” three times in Real Red. Then I stacked them up with Liquid Glue and adhered them to the card front. I added a little silver Twinkle Adhesive-Backed Sequin to the sentiment and the card front was done. On the inside, I added a few more images from the Making Christmas Bright stamp set in Real Red, Call Me Clover, Pineapple Punch and Tuxedo Black Memento Ink to a Whisper White panel. I used Liquid Glue to adhere the panel to a Pineapple Punch mat and into my Call Me Clover card base, popped the card front on with Stampin’ Dimensionals and the card was done. …and a little more All Is Bright DSP to the envelope flap. Et Voila! The Making Christmas Bright bundle and Merry Christmas Thinlits are just the first of some totally wonderful new goodies that you’ll be able to get for yourself on 5 Sept! Or…you can join the team right now (like before the end of the month!) 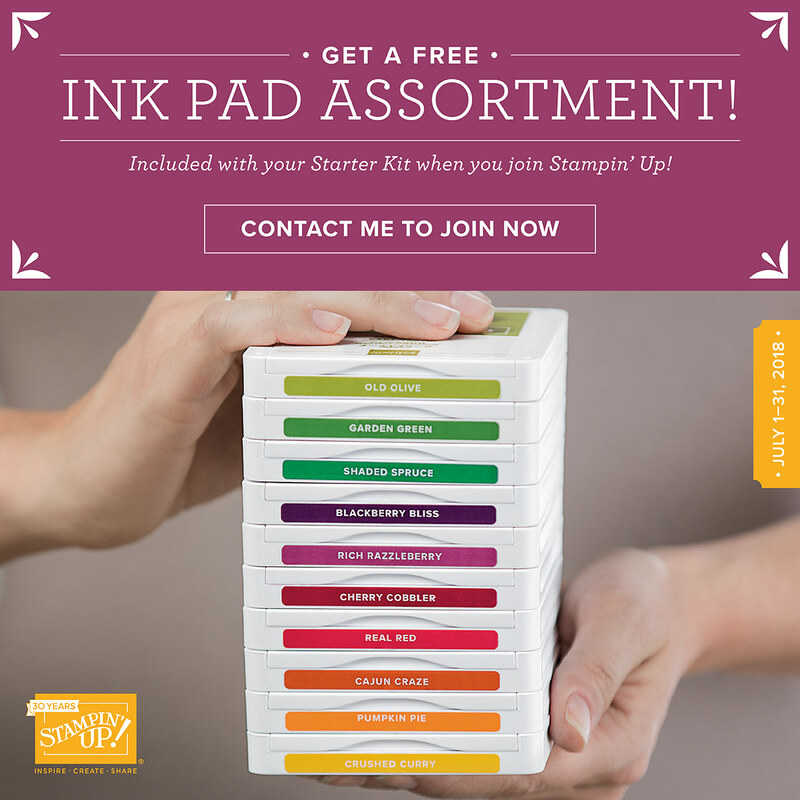 – and get those free 10 Extra Stamp Pads – and then order any and everything from the Holiday Catalog on 1 August. With a 20% discount. Seriously – I’d love to have you join my team – as a business or as a hobbyist! And this is a super good time to do it!! JUST A FEW MORE DAYS!! DO NOT MISS THIS OFFER!! Get the items from the 2018 Holiday Catalog on 5 Sept! So – thought I’d share some pics from the Buchart Gardens we saw on Victoria last week! Mrs. Buchart built these gardens from a defunct gravel pit! Amaze-balls!! The flowers are so beautiful, thank you so much for sharing. Love your happy holiday card with NEW stuff! Your trip looked amazing as are those flowers! So glad you had a great time! She didn’t do it alone!! But, she was the one with the vision. They are beautiful aren’t they?? Pretty card too. My apologies for not seeing your video last night. For starters, I didn’t think you were doing one, and anyway, I wasn’t home! 🙂 Sorry I missed it, but I did download the pdf and have my wish list/order ready to go tomorrow. And why can’t I see the comments any more?? If you are working 12 hour days 7 in a row, we will survive without a card every day or a video on Sunday. don’t want you sick too. What a beautiful Christmas card! Love the colours and the pop of yellow! So fun! Thanks for joining us this week at Freshly Made Sketches! What a lovely card! I definitely have a thing for loopy strings of Christmas lights, so this will be on my list for shur. How nice you’re back with us here in SoCal to enjoy our blast-furnace weather. If you decide to run away, let me know and I’ll go with you!